The Maui Sunrise Macaw is a colorful hybrid macaw full of pizzazz and personality! Though a second generation hybrid macaw, the Maui Sunrise has lots of Blue and Gold Macaw in its parentage. The Blue and Gold Macaw has been one of the most popular pet birds in the trade, renowned not only for its beauty but for its sweet nature and speaking ability. Two other species also add their flavor. The Green-winged Macaw, a long time favorite pet bird, lends both its beauty and its good personality . The Scarlet Macaw, one of the most highly favored macaws and described as "beautiful and striking" adds intense red coloring and a bit of a fiery personality. The Maui Sunrise inherits all these birds beautiful coloring and more. When comparing the characteristics of birds, keep in mind that hybrid macaws are a mixture of their parents. Their behavior and temperament is not absolutely certain. Maui Sunrise Macaws can have the characteristics of the Blue and Gold Macaw, the Greenwing, and the Scarlet in any mixture. The personality of a Scarlet is such that it requires good socialization and a firm consistent hand in training, especially as it matures. The hybrid Maui Sunrise can be a very affectionate, inquisitive, and fun pet; but may very likely need solid, un intimidated handling from its keeper. 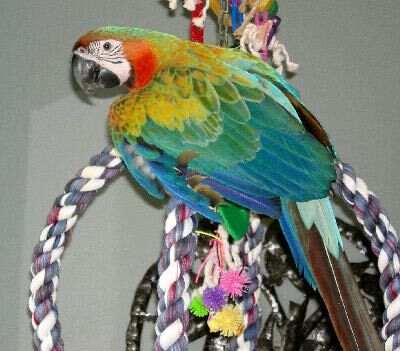 The Maui Sunrise Macaw is a second generation hybrid, a cross between: Harlequin Macaw hybrid (see above) and Catalina Macaw hybrid (see above) . Maui Sunrise Macaws are very colorful, carrying the blues, greens and gold's of the Blue and Gold and the Greenwing, along with the beautiful red coloration from the Scarlet portion of their parentage, especially on their underside. They are a full size Macaw and are highly intelligent and inquisitive. Having a lot of Blue and Gold Macaw parentage, they may learn to talk with a general vocabulary of about 15 or more words or expressions. Hybrids are usually bred for color rather than personality, so their characteristics can be uncertain. A Maui Sunrise Macaw needs good socialization and a firm consistent hand in training, especially it matures. The Maui Sunrise Macaw is a full sized macaw. They can get over 2 lbs. Lengths up to 90 cm (35.5 inches). The Maui Sunrise Macaw typically takes on a composite of traits from all its parentage, having a sweet friendly nature, as well as being highly intelligent and curious. They can be a very good natured pet bird, though the Scarlet influence may also introduce a bit of an indomitable spirit. Though the characteristics of birds that are hybrids are uncertain, they are a typical macaw. Hybrid Maui Sunrise Macaws can be cranky at times and may even be a one person bird or only like men or women unless well socialized with lots of folks. The Maui Sunrise Macaw is rare, only occasionally available, and expensive. There are more and more breeders however, so finding these macaws for sale may become easier as they may become more available.